There is a belief that St. Mary's first bell came from Egglestone Abbey in about 1690 which raises the question of where the bell had been since 1539 when the disestablishment of religious houses, including Egglestone Abbey, was completed by Henry VIII. What is certain is that six bells were hung in the tower in 1824, replacing the existing four bells, two of which had become unserviceable. A contemporary account shows that spaces were left for two further bells, to be purchased by public subscription. The original six bells (now 3-8) were cast by Mears of London and arrived in Barnard Castle amidst scenes of great rejoicing. The wagon which carried the bells was "decked out with flags and escorted by hundreds of the town's inhabitants." The cost of the bells and their installation was defrayed by money from the sale of the old bells and by generous personal donations. The bells alone had cost £526. 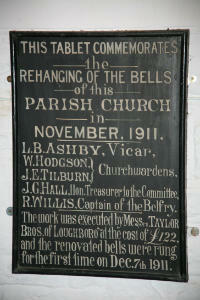 There is a plaque (picture left) commemorating the rehanging of the bells in November 1911 and is mounted on the wall of the ringing chamber. 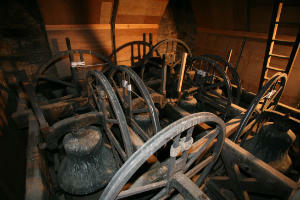 The bells in their present state is shown in the picture to the right. The heaviest bell (Tenor) is in the back corner. The bells are shown in the "Down Position"; to enable the bells to be rung they have to be raised, so that the mouth of the bell is facing upwards (Up Position). The weights of the bells shown in the table below are measured in hundredweights, quarters and pounds.